4 Bedroom, 4 Baths, Bar area, 800 sq foot rec room that sleeps 8-10 with big screen TV, Netflix ready. WIFI. 2 fireplaces inside, Screen Porch with fireplace, Gourmet Kitchen with Keurig coffee maker. Steam shower. Air conditioning. 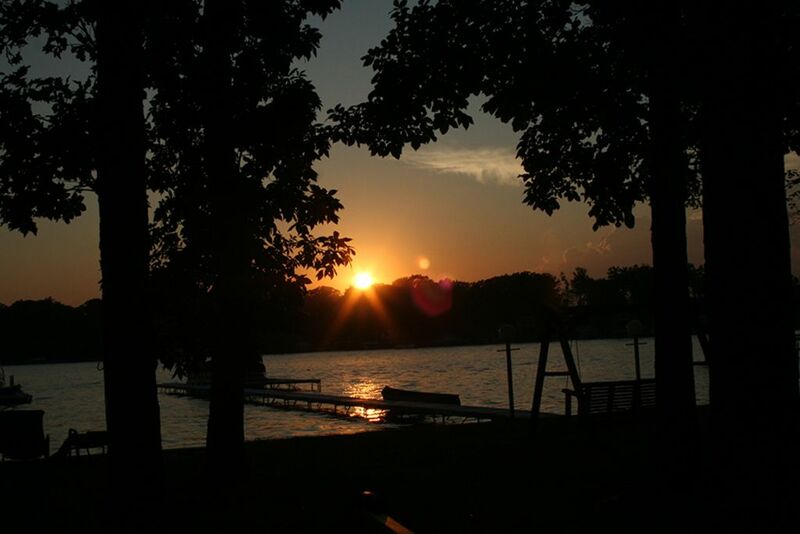 House is 40 feet from the lakefront with 160 foot pier for docking your boat on 550 acre all sport Magician Lake. Sandy area for children to play, lake is shallow in swimming area. House sleeps 18-20+, up to 16 can easily sit at large farm table for family dinners and games. I currently live in Wheaton, IL with my 2 teenage sons and 2 large dogs. My dream was to build a home made to last generations in my family, and I have put that vision into every aspect of this home. This property has been completely rebuilt from the ground up in the last 8 years. It is light, airy, built for comfort, privacy and entertaining. Kitchen is open plan for those who love to cook and eat. Several families can comfortably enjoy this home together. Enjoy water sports on the lake which has no resorts, only private homes. On the East side of Magician Lake, a 550 acre all sport lake. Long pier with shore station suitable for all types of boats. Water directly in front of property is shallow, sandy, ideal for children. Wolf 6 burner Range, dishwasher, large prep area with fun restaurant style faucet. Open floor plan to dining area and living room. Large farm table extends top seat up to 16, plus eat in breakfast bar, plus 4 seat bar table. House was way bigger than I thought it was from the outside, steam shower was a dream and the sunsets where awesome!! Family of 20 enjoyed a week in this beautiful home. First time vacationing in Michigan and had a great time swimming, taking boat rides all around the huge lake, wine tasting tour and shopping in Saugatuck. Enjoyed cooking in the gourmet kitchen and the steam shower room is fantastic. A great time was had by all!! We are a group of 3 families who rent annually all around the country and this was our favorite home and location, by far! The owner has paid attention to every detail and we were so comfortable here. We swam in the lake, went boating, cooked huge meals in the gourmet kitchen and relaxed on the screened porch next to a wonderful fireplace. Fantastic! Thank you for sharing your home with us! This house is wonderful! We had 17 people and were comfortable. It was easy to all be together and enjoy out time. The outside area is great with the grill and fire pit. It was very hard to leave. We had a group of 18 and fit comfortably. The house is roomy and there are a ton of amenities like the gas grill, lakefront, and all the books, games etc. in the house. Previous users left a lot of food etc. that we did not expect nor the drawer full of spare clothes! We were all able to gather in the living rooms for party games and generally eat at the same time. If the occasion arises again, I would certainly look into renting this house again. Located amid numerous wineries/vineyards and orchards.